At the request of the publisher, a PDF was sent at no cost to me, for my honest opinion. 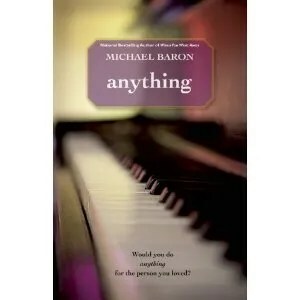 Synopsis (from back of book): With Anything, Michael Baron again draws readers into a world of deep emotion, compelling relationships, and heartfelt humor, and this time he adds a touch of fantasy. Ken and Melissa are at the dawn of a magnificent life together. A passionate romance has led them to the doorstep of marriage. While searching for the perfect wedding present for Melissa, Ken stumbles into a mysterious shop. There, he is given an extraordinary opportunity – to look in on Melissa when she was a girl. Ken has always wished he could have known Melissa from the day she was born and this seems like an incredible blessing. Until he discovers a terrible secret in Melissa’s past, one so awful she has found it impossible to mention to him. Now Ken has another extraordinary opportunity. He can go back in time and change the horrible event that has left an indelible mark on Melissa. He can free her of this burden – but doing so could change things so completely that they might never meet. Ken has repeatedly told Melissa that he would do anything for her. But would he truly do anything? My Thoughts and Opinion: I was introduced to this author back in December of 2009 when I read and reviewed his novel, Crossing The Bridge, and instantly became a fan. Since that time, I have read the majority of his books and have yet to be disappointed. Matter of fact, his books are like a fine wine, they seem to get better with time. I was a bit skeptical when asked to review Anything, especially after reading his last book Spinning, which I rated 5/5. Could he do it again? This novel had all the “Michael Baron elements” that first grabbed me, but then it also had a slight spin that had this reader wondering about once the last word was read (do not want to include spoilers). Mr. Baron’s tender, masterful and descriptive writing style allows the reader to be transported and become part of the story line. The characters come to life with the ability not to just read their emotions but actually feel and experience them. The vivid descriptions of the scenes provides the reader the ability to create their own life like story line that carries the reader side by side with the characters, like a mind’s movie. As for the premise. Haven’t we all said at one time or another these words, I would do anything for (fill in the blank)? But would we? At what cost? Not only is this book poignant, emotional, with a little suspense, and even a bit of fantasy but it is also thought provoking long after the book has ended and the reader is sitting there and now wondering, Would I do anything? Just like a perfect performance by a concert pianist, I say to Mr. Baron, BRAVO!!!!! !